Vietnamese belongs to the Austroasiatic language family (that also includes Khmer, which is spoken in Cambodia). It was heavily influenced by the Chinese due to centuries of Chinese rule and as a result around half of the Vietnamese vocabulary consists of naturalized Chinese expressions. Later, as a result of the French occupation and strong cultural influence from the West, a lot of new words were added (such as "tivi" for TV). 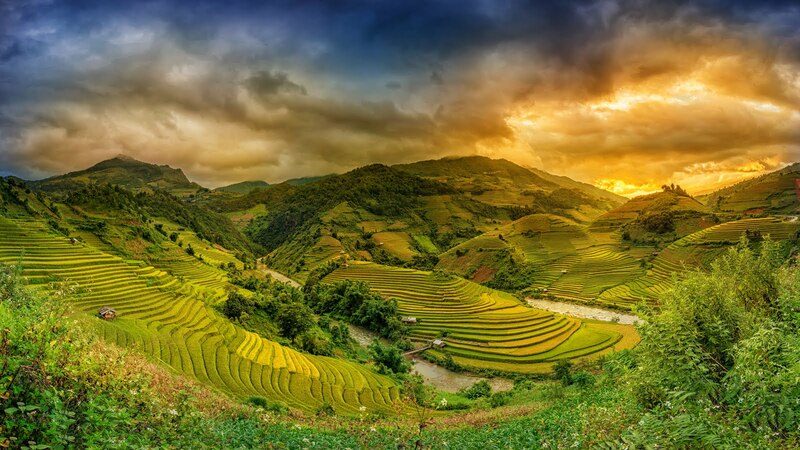 Terraced rice fields in the sunset – Mu chang chai, Yen bai, Vietnam. Vietnamese is the national language of Vietnam, spoken by approximately 70 million people in Vietnam and about another 3 million mostly in East and Southeast Asia, as well as the United States and Australia as a result of vast Vietnamese emigration. Vietnamese-speaking communities and their cultural influence that surprisingly integrates Vietnamese minorities has caused the language to be recognized in very surprising parts of the world. In the Czech Republic, for example, Vietnamese even has an official status. It is recognized as one of the minority languages that entitles Czech citizens from the Vietnamese community to use Vietnamese language in communication with the public authorities as well as courts. In those municipalities where Vietnamese exceed 10% of population, the language is used also in public information channels (including election information), and the minority is entitled to require assistance in its language. Vietnamese uses the Latin alphabet (quốc ngữ), but with frequent use of diacritics, and has borrowed a large part of its vocabulary from Chinese. Formerly until the 20th century, the language was written using the modified Chinese writing system set (chữ nôm).